Four construction companies have been mandated to execute the infrastructure of Egypt's new administrative capital project east of Cairo starting Saturday, Egypt's Housing Minister Mostafa Madbouly said in statements reported by state news agency MENA. The construction of the first phase is set to start in April, with the cabinet approving earlier the connecting of facilities to the first phase of the new capital with a cost of EGP 4 billion. Earlier in March, Egypt's President Abdel-Fattah El-Sisi affirmed in a meeting with Madbouly and the army's engineering authority Kamel Al-Wazir the necessity of finishing the first phase of the capital within two years, with the highest international execution standards. In the meeting, Madbouly pointed out that a state-owned company would be the main developer of the project, taking over the general planning and introduction of facilities as well as the execution of the residential area. He added that bids on private companies to execute the first phase of the project will start in the upcoming months. 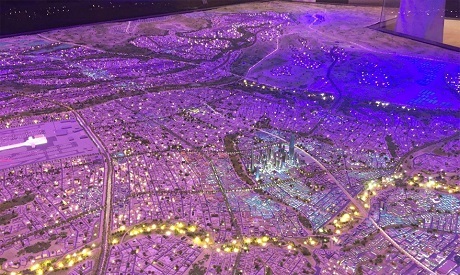 The megaproject's first phase will include 12 ministries and a number of other governmental institutions, a residential area that would have more than 25,000 housing units, and the world's biggest park. Al-Wazeer also said that the army's engineering authority has already started in the execution of 210 kilometres of roads with a width of 120 meters in the new capital site, as well as adding that the authority has started the implementation of bridges and the ring road that would connect the new capital with New Cairo. The new capital, which is part of President Abdel-Fattah El-Sisi’s plan to boost the economy through a series of mega-projects, is estimated to cost $45 billion. Several foreign visits have been made by El-Sisi in the last months to discuss investment opportunities for a number of developmental projects. In January, Egypt and China signed financial deals including loans, grants and memorandums of understanding worth around $15 billion of which a part is expected to be invested in the infrastructure of the planned new administrative capital. Chinese companies will only provide Egyptian contractors with long maturity loans to finance the construction of 14 new governmental buildings, major conference centres and a fairs area, Madbouly said at Cairo-based conference in March. Great soundbites: 'world's largest park, why?' .. '120 meter-wide roads' .. '12 ministries' .. 14 government complexes' .. '$45 billion' ... here are the most important missing data: how many jobs, economic impact, how many schools, how many hospitals ... who cares about all of that; it's a Sisi's mega-project with phase 1 done in 2 years ready for re-election (God forbids)!